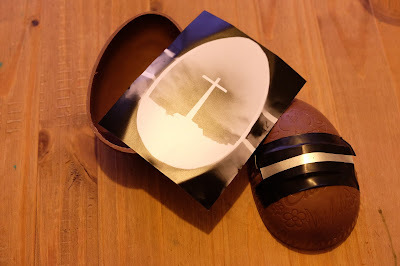 For Easter I made a pinhole camera out of a chocolate easter egg. The main challenges were it melting, cracking and light leaks around the seal. When I was happy it wasn't going to melt to quick, I cut a small hole in one half. Over this hole I place a thin strip of aluminium with a pinhole in it. Kept the egg in the freezer again until I was ready to put it together. 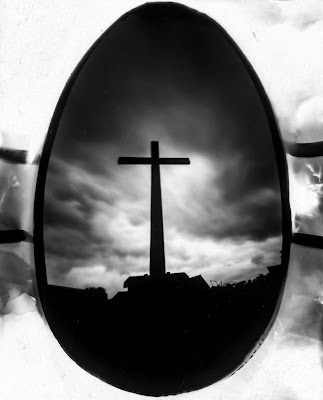 In a darkroom I quickly and gently lined the two egg halves together with some B&W Ilford MGIV Photographic paper between them both. 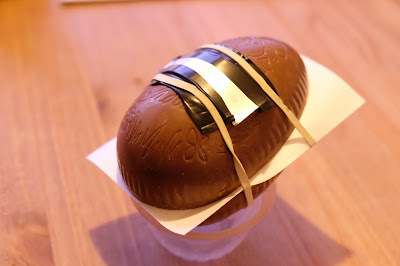 The pinhole was held in place with some black tape and 2 elastic bands held it all together, I then lightly wrapped the egg foil back around to reduce the amount of light getting in between the halfs. 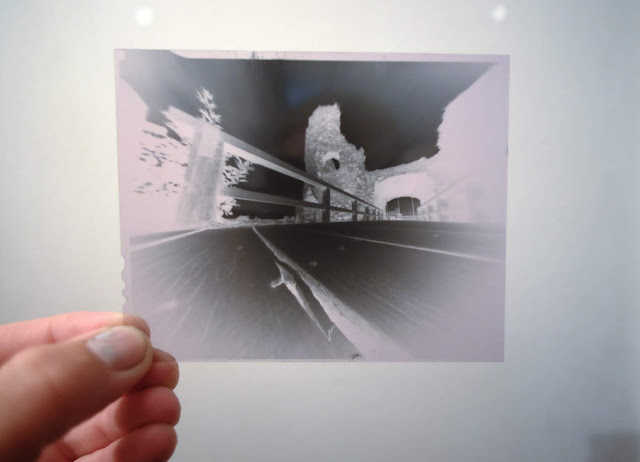 When it was ready I place some black insulation tape over the pinhole and was ready to get it out the darkroom for its 1st test shot. Happy with the 1st test shot, I refroze the egg and reloaded it with another sheet of B&W Ilford MGIV Photographic paper. 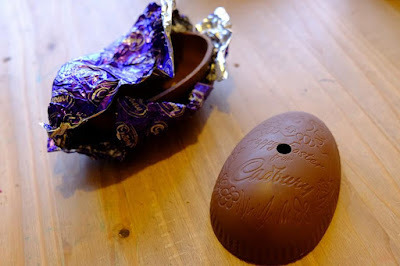 Easter being a time which many celebrate differently, some its all about chocolate eggs, others its a time to celebrate the resurrection of Jesus Christ. My aim was to capture both and photograph a crucifix with a chocolate easter egg. 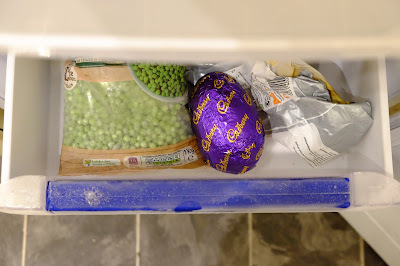 I packed the egg up in a bag, kept the car as cool as possible to avoid the egg getting to soft and the elastic bands cutting into the chocolate and headed out in search of a crucifix. When I found one I got a light meter reading using a free smartphone app to work out the exposure. I managed to set the egg balanced in a cup to help support it, pointed it in the right direction and exposed it for around 30 seconds. Headed back home to the darkroom and set about taking it apart and developing the photo. 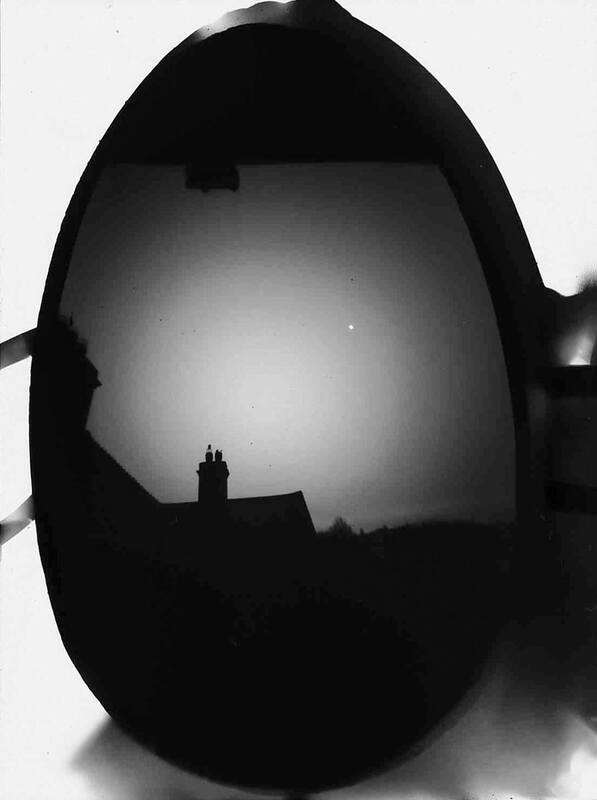 The Egg with the negative image after being developed. Solargraphy..What is it, and how do you do it??? 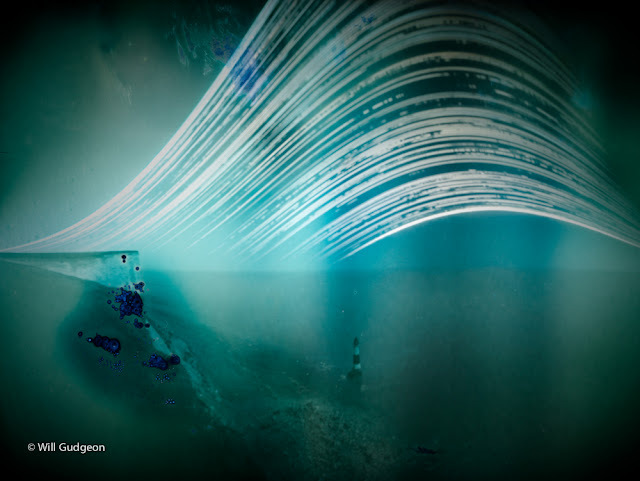 Solargraphy, What is it, and how do you do it???? Here is how and what it is...and what you need. Finished my last 3 sheets of Ilford Delta 100 4x5 tonight. My last 3 sheets of Ilford Delta 100 4x5, I finally finished tonight. On Monday evening I finally finished of my last 3 sheets of Ilford Delta 100 4x5 in my Zero Image pinhole camera. Tuesday evening I developed them at home using my Paterson developing tank and Mod54 4x5 film sheet holder. Developed them in Ilford ILFOSOL 3. This mornings "Behind the pinhole camera". This morning (Saturday 4th) I headed out at 5:45am after an early awakening from my 2 year old. I had my Zero image 4x5 packed along with my ONDU 6x12. I headed to the seafront for a quick skate with the dog. I wanted to try skateboarding with my pinhole camera, you may have seen a set up idea on a previous post. My first 2 exposures from my Zero image I had the camera attached to the board, only downside was due to it being 6am, light was still low and was having to do 60 second exposures taking into account the reciprocity failure of Fomapan 100. After my skate I headed up to view Beachy Head Lighthouse for my 3rd exposure. Added all 3 extensions so it wasn't so wide, this was a 6o second exposure. 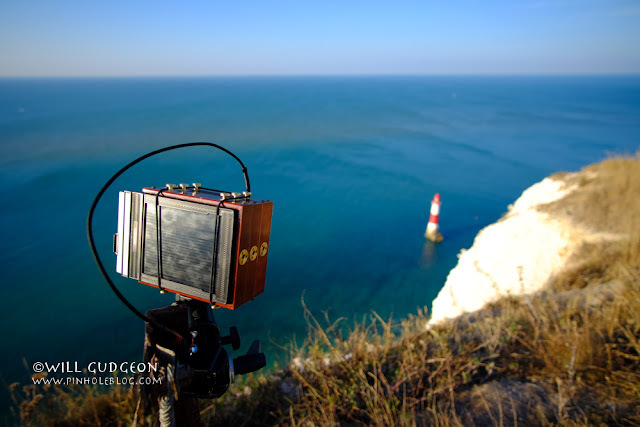 I also shot 1 exposure with my ONDU pinhole here too. Both cameras were held in place using my Manfrotto Super Clamp and small ball joint head.